Even though Cancun looks like parts of Florida, it is in Mexico - a whole other country. A shocking number of Americans forget this fact and try to fly without documentation. Starting December 31, 2006, all US citizens will need your passport to go to Mexico, including infants and children. If one parent is flying with the children, the airlines will require a notarized letter of permission from the non-traveling parent. You also have to fill out a tourist form (check to see you signed on the back if necessary). Don't lose it during your vacation or you will get fined when you leave the country. If you do lose it, report it stolen to the police and the airport officials will accept the police report in lieu of the form. Playa del Carmen has a small airport that mostly offers trips to Belize, Guatemala, Chitzen Itza or other Mayan ruins. A good way to get cheap tickets to Cancun is to call your local travel agent because they will know the charter flights and deals close to you. Another way is to read the ads in the travel section of the paper - there are always deals to Cancun. If you see an ad that advertises a hotel and flight package, but you want to travel independently and forgo the hotel, call them anyway. Sometimes they will sell you an air only package. 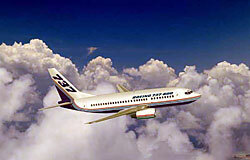 International airfare reservations are also available online. Try to get off the plane quickly, because the lines at immigration are long. Be sure to sign your tourist form on the back - everyone forgets and it slows down the line. After you get your luggage, you go through customs so have your customs declaration form in hand. They have a stoplight contraption - push the button and if it is green you go through, red and you are searched. Sometimes they will search you anyway, so don't be shocked. If the line is really long, the customs agents usually decide to search everybody. Don't know why, it just happens. Then it is welcome to Mexico. Ignore the men at official looking desks pretending to recognize you as part of their tour group. They are just looking to sell you something. DO NOT CHANGE MONEY HERE the rates are terrible. Do take all the brochures and booklets handed to you. Some have good maps and coupons. You can get a good deal by making car rental reservations online (we've heard of a $117 weekly rate - amazing). It is easier to use an airport transfer company like Caribbean Coast Travel instead of a taxi or bus. When you go to the Cancun airport to fly back home. If you are in the new terminal, don't go to your gate until the last minute. The new terminal has a playground, food court, TGI Friday's, places to sit, shop, or walk around, and new bathrooms. Once you leave the new terminal to go to any of the older gates you are in a smoky dirty waiting area with chummy food. If you find a cheap flight into Cozumel, take it. The ferry runs from downtown Cozumel to Playa del Carmen all day, so you can easily leave Cozumel and explore the coast.